Tringov v Gheorghiu, Bulgaria v Romania 1971, the position featured in our What Happened Next? series on Tuesday and Wednesday. Tringov must have been nine moves short of the time control then in force - surely he can't have been in time-trouble? Not in a game he believed was fixed for him to win. Either way the move he found a move was even worse than 48.Kc1, and indeed worse than any other move he could have played. But at the same time, a move of sufficient quality to rate with any other in our series. Well done. 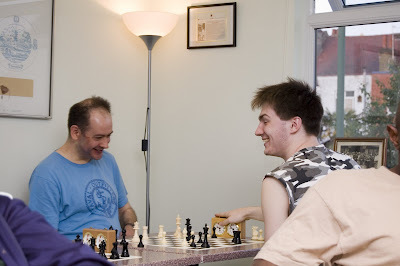 What do the adverts on chess sites tell you about chess players? 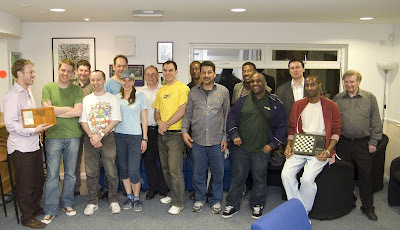 According to chess blogger tanc(happyhippo), that "chess players are a pretty sad, lonely bunch"! That's because his favourite chess site has recently been advertising what looks like a mail-order Russian bride website. Mm . . . But perhaps he shouldn't feel so insulted. These adverts, like many on the web, appear to be automatically generated according to the words used at the site itself, and it is hardly a surprise that the word "Russian" would have come up frequently. Although, I know how he feels. A feature of google reader - something I use extensively and recommend to anyone who keeps up with more than one website - is to recommend websites to its users that it 'thinks' they might like, based on comparing what they read online to what other people read online with similar interests. I normally get recommendations for chess, of course, also for news, politics, sometimes sports and other games, sometimes cartoons and comedy sites, that kind of thing. But recently my mouth fell open as the reader recommended London Geek Dinner to me - "Where geeks in London come out to play". Nothing geeky about that, right? Mm... If only there was a site for over-sensitive people in London - "Where over-sensitive people accidentally offend one another" - google reader would be recommending that to me now instead. After all, I recently found myself feeling insulted for not being chessy enough whilst reading Yakov Neishtadt's excellent (especially for £1) book Test Your Tactical Ability, Chapter 12 of which is called "Do you know the Classics?" Now there's a kind of beauty to outlast the debatable delights of any mail-order marriage. "Anand, by the way, did not have a strong tournament, and it is quite well known that he is not a very patient person. 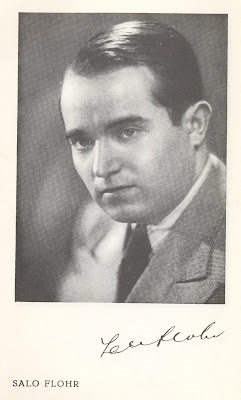 In his youth he played very quickly, living only on his enormous talent. He never became the great player he could have been, and I predict he will not be"
My question appears to have generated a fair amount of reaction, see for example Dennis Monokroussos' blog The Chess Mind, but as far as I know only 'Stig' - presumably not Top Gear's anonymous racing driver- has identified the author. Well Tom got the answer too but since he went on to talk himself out of it there's no cigar for T.C. 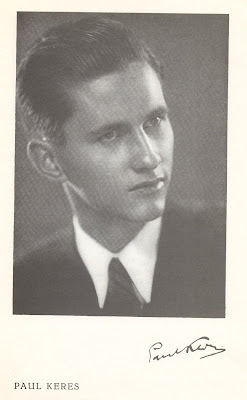 It's time to reveal our mystery scribe as Jacob Aagaard who was writing in Excelling at Chess (Everyman Chess, 2001). Aagaard is now British Champion (and a one-time commenter on our humble blog) but back then he was a relative no-mark at 2360 elo. To be honest, I hadn't intended the post as anything other than a cheap shot of the "let's make fun of a guy for whom the passage of time has not been kind" variety. Inspired by Richard's comment to the original post I re-read Aagaard's words and I began to wonder ... might he be right? Even now? Even if Anand does go on to beat Kramnik has he become the player he could have been? Is Anand the strongest player in the world today? I suppose we'll see when he plays Kramnik, but perhaps a more pertinent question is how he rates in historical terms - a Tarrasch or a Keres perhaps rather than a Lasker or a Botvinnik? At best a Tal? Even if you think he deserves to be higher up the ladder would you say he's fulfilled his potential? Is this all a little unfair to Anand? Maybe so but making fun of Aagaard was definitely somewhat harsh. If nothing else Excelling at Chess at least has something to say which is more a lot of chess books can claim. I'll be coming back to Aagaard's book over the next couple of weeks - and while normally I usually get distracted and wander away to other things, this time I definitely mean it. Tringov - Gheorghiu, Bulgaria v Romania match 1971. Our narrator is David Levy in Chess, May 1979. In 1971 in the Romania-Bulgaria eliminator for a place in the finals of the European Chammpionship, on top board...[Gheorghiu]...had to play two games against the Bulgarian grand master Tringov. Now Tringov could win easily with 47.Kc3! *but instead he played 47.a6 whereupon Gheorghiu could not resist 47...Nb4+ 48.Kc3?? and now 48...Na2 mate. Because he had turned the tables in this game Gheorghiu had scored 2-0 instead of 1-1 and as a result Romania scraped into the European Finals instead of Bulgaria. Tringov was furious but what could he do? 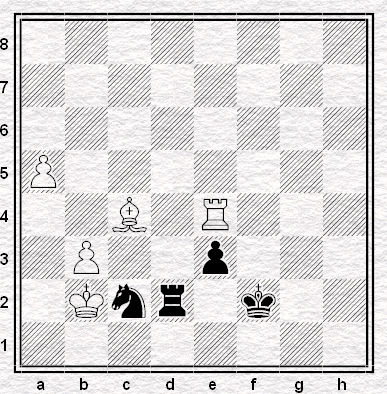 Position after Black's 46th move. Is it raining all over your Bank Holiday Monday, too? Well, at least we have some good club news to spread a bit of sunshine around. 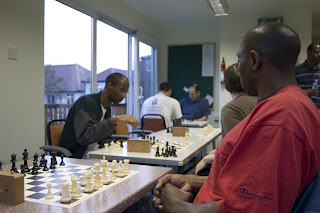 Because two Mondays ago, Streatham and Brixton Chess Club won the Eastman Plate, and by the tightest of margins: 5½ to 4½ against an Insurance side who outgraded us on most boards. Congratulations to all who played, and especially to Chris "Captain Miracle" Morgan, whose sides just can't stop winning. But that's not all. Congratulations are also due to our First Team in the Croydon League. 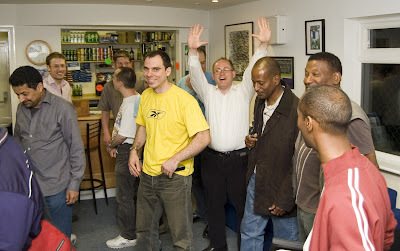 Robin's opponent from the match against Crystal Palace resigned before resumption, which means we won that match and thus finish top of the table overall to win the Croydon Shield, ahead of Cousldon by half a point. Meanwhile in Divisions 2 and 3 of the Croydon League both of our teams finished an impressive joint second. Also second this year are our team in the Stoneleigh Trophy, and Captain Robin Haldane writes that his team "hope to do better next year and that we can join QPR in winning the title." A different kind of puzzle this week. 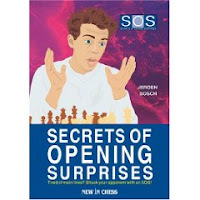 Secrets of Opening Surprises, New in Chess. A New Evil? A New Good? 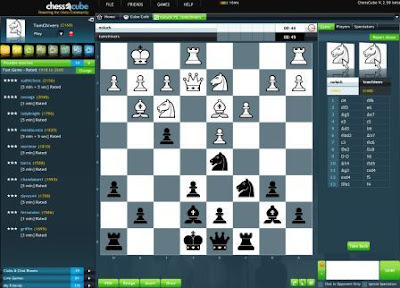 Let's agree that both the PlayChess server and the ChessClub server have two fundamental but surprisingly useful flaws: One, that you have to pay to really get the most out of them. Two, that you have to download software to use them. The latter flaw makes them unlikely candidates to destroy your desk-job, to leave you staring into your computer screen until the early hours, as life bubbles on all around the city without you, as you play out just one last 1+0, before finally getting down to that report due yesterday, that you tell yourself you're really about to do, this time... Meanwhile, the former flaw creates a prosaic boundary many flinch at crossing, for reasons of personal finance, pride, self-image, priorities, whatever. Thus we can find it within ourselves to resist these two perfect dealers of the stuff our addiction is made, to deny ourselves their unending rollercoaster ride of adrenaline and dejection, mixed with lectures and live coverage, ending with a migraine. FICS - free but otherwise similar - has a distinctive second flaw: the general absence of any strong players there to play blitz chess. So, we can stay mostly safe from the evil that all three might bring to our lives, and their flaws for our addictions are revealed as really gifts to our sanity. 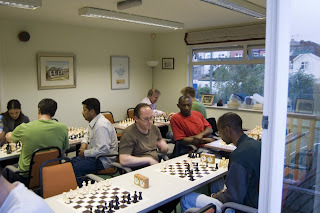 The passion for playing chess is one of the most unaccountable in the world. It slaps the theory of natural selection in the face. It is the most absorbing of occupations. The least satisfying of desires. A nameless excrescence upon life. It annihilates a man. You have, let us say, a promising politician, a rising artist that you wish to destroy. Dagger or bomb are archaic and unreliable - but teach him, inoculate him with chess. 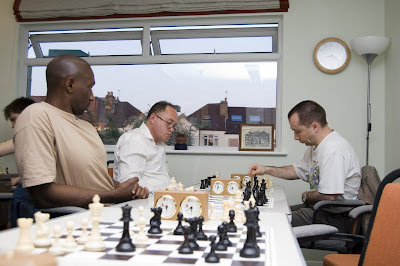 Never let it be said that we don't bring you the big chess stories here at the S&BCC blog. Today, ladies and gentleman, it is our happy duty to report that the political campaigner formerly known as the World Chess Champion recently had a speech interrupted by a flying plastic phallus. 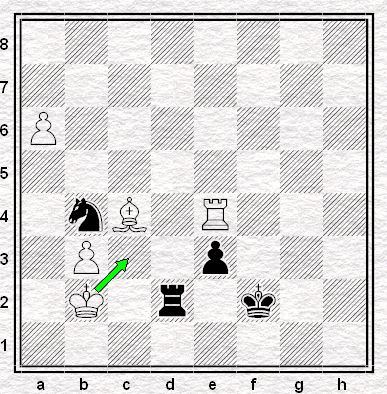 Matulovic-Bilek, Sousse Interzonal 1967, position after Black's move 37...Qc3-c6. White now played either 38.Bf3?? or 38.Kg1, depending on how you look at it. Matulovic played 33.Bf3?? * and before Bilek could play 33...Rxf3 Matulovic put the Bishop back on e2 and played 33.Kg1. [Matulovic claimed] that he was merely adjusting the pieces on the board (J'adoube). His opponent, Hungarian GM Istvan Bilek complained to the tournament director, but no action was taken. The game ended in a draw. After this incident, Matulovic was given the unflattering nickname of "J'adoubovic". 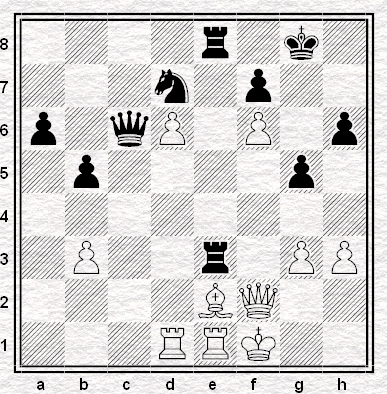 Position after Black's 37th move. 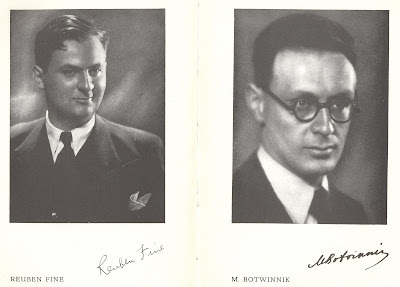 I found these photographs in a dusty old pamphlet published by the BCM containing the moves of the great AVRO 1938 chess tournament, and frankly, I also found them to be rather splendid. I published one previously here, asking readers to guess what kind of player was pictured, but I felt interest was not particularly high in answering that question - so I thought that instead I'd post the whole lot here and now. Enjoy, and as ever you can click each photograph to see an enlarged version. 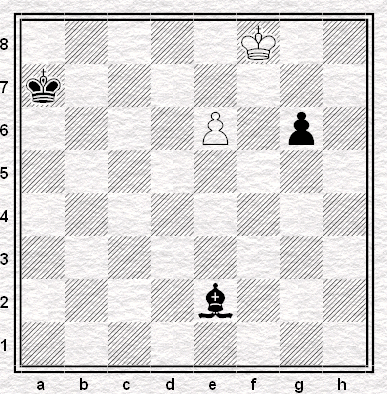 White to play and mate in two moves. Nothing, no matter how permanent it may seem, lasts for ever. Take the FA Cup for example. These days the big clubs can barely bother their arses to field their reserves for cup ties let alone full strength sides. It's not like, picking a year entirely at random, 1976 say, when The Cup Final (the capitalisation being appropriate back then) was very much the pinnacle of the season. In those days, of course, the cup final was probably the only game you could see live on TV all year - World Cups and the odd appearance of an English club in a European final being the exceptions. It's not easy to get worked up about it today when there are any number of games shown in their entirety every weekend. As hard as it is for my generation to believe, the FA Cup just isn't important anymore. If the cup final has already drifted into irrelevance then it seems chess adjournments are going the same way. Over recent weeks there's been a debate as to whether or not quick-play finishes should become the default option in the London League and I think it was Justin who suggested that regardless of the outcome of the current discussion the change was probably inevitable in the long run. "... in recent years international tournaments have been run more and more frequently on a severe schedule, whereby between the main session and the adjournment session one and a half hours to two hours are allotted 'for everything': eating, relaxation and analysis. It hardly needs to be said that frequently one doesn't even have time to remember about the first two components...."
I wonder how he'd find the modern game circa 2008 as compared to that of thirty years ago. So perhaps we must bow to the inevitable and prepare ourselves to bid farewell to the chess adjournment. In the meantime we can at least remind ourselves that it was once thought fundamental to the game. In my favourite example from his book Polugayevsky writes of the many hours of adjournment analysis he devoted to a curious queen against two bishops ending. Once he returned to the board his work allowed him to spend just a couple of minutes on the 24 moves it took to wrap up the game. Yes indeed. However rubbish modern life might get books will always be there to take us back to a time when things were fab. Well, books and YouTube. Close friends already got to call him T.C. 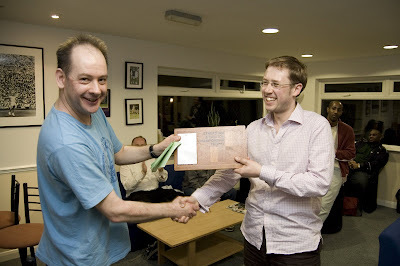 but now along with everybody else, they also get to call Tom Chivers 'Streatham & Brixton Chess Club Champion 2008'. Last week we left things at the halfway stage with Tom in third place behind Alexey and Angus who were both on a perfect 3/3. 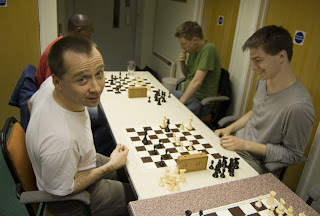 Two games later he was in the lead and facing a last round showdown with 2007 champion Robin Haldane. On board 2 Adam survived Angus' Haldane Hack to reach 5 out of 6 which left Tom needing to win with Black to avoid a play-off for the title. Fittingly, the top board clash was the final game to finish and the tournament ended with Robin, artist to the last, weaving a mating net around his own king as Tom's pawns marched down the board. with Adam, Martin, Angus, Jan, Mohsin, Zornitza and Mark picking up books from the Thake collection. So it was Chivers wot won it. Perhaps it was not so surprising - the club championship capping a remarkable year for him. Aside from victory in the mid-season rapidplay (with a perfect 6/6 no less) Tom has out-performed an already respectable grade by some 20 to 25 points in club matches this season. The secret of his success? I couldn't possibly say, although those searching for a clue might want to check the video at 1:13. Anyway, well done Tom, well done everybody who took part, and thanks once again to Vad for the taking the pictures - just click on them to see the full-size versions - and Angus for organising the whole thing. I'm already looking forward to the next one. Some time ago my girlfriend, much to my hidden amusement, developed hiccups. Much to my unhidden amusement, she announced that she was going to terminate them using the "eggbox technique". So, right there, in the middle of the kitchen, she closed her eyes, let her hand dangle in front of her as if it were about to pick up an imaginary egg, then picked up that imaginary egg and deposited it in an imaginary box. She then picked up another imaginary egg and placed it in the imaginary space adjacent to the original imaginary egg, and so on until the imaginary box was full. After that she took the imaginary eggs, one by one, out of the imaginary box and started arranging them in a second imaginary box: until she stopped and announced that her hiccups had gone. Which, indeed, they had. I was impressed. She thereupon proposed that the next time I develop hiccups, I might care to do the same. I might, I said - but then again, I might not. Because it's silly. But I wondered if instead, if I'm going to move my hand about in front of my face for long enough to distract a bout of hiccups, I might as well play a game of chess - which wouldn't be silly at all - rather than act as warehouse man for a couple of dozen non-existent eggs. Why not? I shouldn't say so, but I've sometimes used chess as a cure - or not - for insomnia. I got the idea from Snoopy, who once sent himself to sleep by playing an imaginary round of golf at Pebble Beach: he fell asleep during the second hole. Some people count sheep: I've tried to play a game of chess in my head with the same idea in mind. I never understood how counting sheep was supposed to work. I mean I understand the concept of sheep, and I think I've mastered counting - but I didn't understand why it was supposed to send you to sleep. Whether it was supposed to make you forget what was bothering you, or whether you would establish a rhythm that would lull you to sleep...I don't know. Anyway, it doesn't seem to work: not the counting, not the chess. I usually start off e4, e5, knight f3, knight c6 and take myself through a Ruy Lopez...but either I lose track, half-asleep as I am, and forget what move I was on, or I run out of moves towards move twenty of a Breyer variation. Or I start running through a current correspondence game in my head, and that's the last chance for hours that I get of any sleep. You can see how it might be a way to sleep, or be a aid to concentration, but not how it could be both. Clear your mind, then fill it with one thing: years ago, I learned a little transcendental meditation and when I think about it now, my mantra was supposed to do just that. I could, I suppose, try and meditate my way out of hiccups. But I still think I'd prefer to try a nice game of chess. If eggs can outlast hiccups then a game of chess might do the same. Provided it's the right game, a logical game so one remembers how it goes, without having to recall any complicated tactics. Not too long to remember, but not too short either lest the resignation come before the hiccups have departed. A favourite game. A game I've seen many times before, making it easier to commit to memory and easier to recall. I thought about it and came up with the sixth game of the Fischer-Spassky match from 1972. The one in which Fischer took the lead, the one in which he opened 1.c4 and played the first Queen's Gambit, as White, of his career. 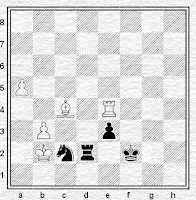 It doesn't hurt that I often begin with a flank opening move and transpose into the opening of the game: for this reason, the moves seem natural to me. There are forty-one of them, or eighty-one half-moves: at the time, they took, as far as I know, five hours to play. How long should I make them last? 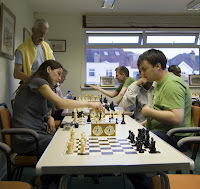 As long as it takes, I suppose, but what would be the ideal balance between playing them too fast, and getting through the game before I have banished the hiccups - or on the other hand, leaving too big a space between the moves and thus risking the interruption, by hiccups or by anything else, of my concentration? I'm not sure. I'll have to memorise it first: and practice. See how it goes. Shall I lay the pieces out before I start, or take them, too, just like the eggs, out of their imaginary box? Shall I walk, like an imaginary Fischer, onto an imaginary stage? And shall I punch, for both players, an imaginary clock? Hand stretched out: let us begin. 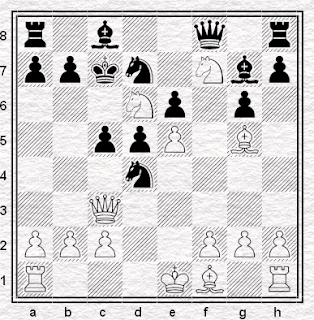 Fischer opened 1.c4: Spassky answered, 1...e6. 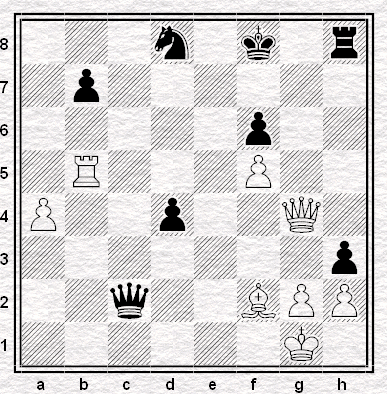 Fischer played the king's knight, 2.Nf3: Spassky played the queen's pawn, 2...d5. 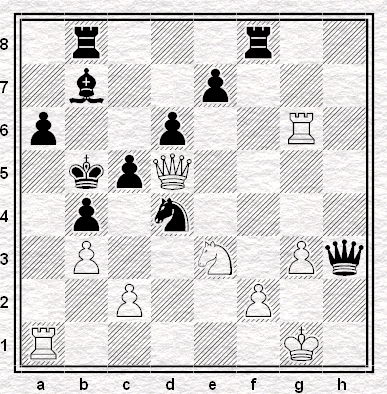 Fischer likewise, 3.d4: Spassky also played his king's knight, 3...Nf6. And so it proceeds: like a mantra, like the progression of sheep, smoothly and logically, unbroken, without the irruption of thought or of hiccups. Here's a couple of good efforts from the last weekend of the 4NCL. Contrasting efforts too, and unsurprisingly, given that the winners were Robin Haldane in one game and the present writer in another. 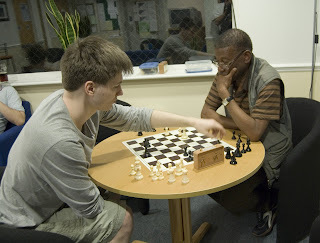 Robin's game was his nth win with the Haldane Hack: mine, my fifth win against a FIDE Master. it's the sort of position where you start counting the pieces to see how much Robin's sacrificed so far - and then, when you find the answer's "none", you wait to see how much longer before Black resigns. "Not long", as it happened. 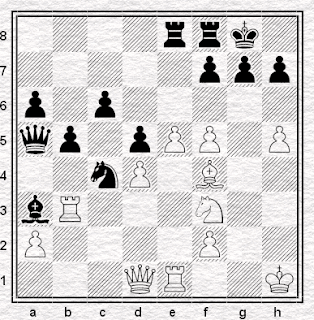 Robin does attack, I do defence: here's the position after White's 25.Kg1-h1. All White's pieces are steaming over to support the pawns' assault on the Black king: more than half of Black's pieces are far away and there's a forest of their own pawns blocking the way between them and the battlefield. You'd think they'd never get back in time. But they did. Thanks for removing those comments, I was left no choice but to defend myself. I see that a lot of the negative stuff is still up there and I do have something to say about this. I've probably bought more chess books than your entire club put together, including some by the most damned authors out there. And it's never occurred to me to try and do any kind of nitpicking hatchet job on them. Why? The way I see it, books are just about the best value out there, you can gain insights into just about anything for the price of a few pints. 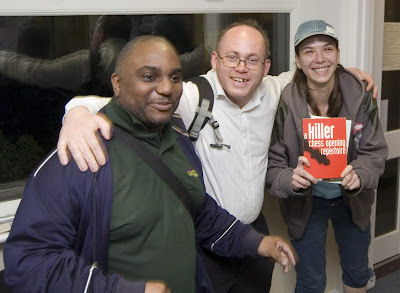 And even the supposedly 'worst' authors (which ain't me or Glenn Flear btw) usually have something interesting to say. As an example, I started playing the Kan Sicilian after using a book on this opening that got really slated by the reviewers. It gave me an idea about the lines after which I started playing around with the thing with a board and pieces. It never occurred to me that I should be spoonfed or that this book should be perfect in every way. It saved me heaps of time in getting to grips with the thing and provided a starting point for my own thoughts. Maybe the question you should be asking is why people are so negative about books. I believe the that the answer may be the key to why they're not better players. A few bits and pieces of club news. London League Division 1 has reached its conclusion, with Streatham narrowly overcoming a closely-matched Mushrooms 1 side in the adjournments of our final match of the season to finish in the top-half of the table with a respectable 6½ match points. Congratulations go to Wood Green, title-holders once again - although unlike last season they missed out on a perfect 11/11 thanks to this surprise loss to Drunken Knights. Finally, don't forget that the Club Championship concludes tomorrow at our Woodfield Grove venue starting 7.30pm. A half-way report can be found here, and an added attraction will be the continuing one-off sale of Andy Thake's old books for the bargain price of £1 each. "[ Text removed - JB ]"
you remove the entire post immediately. I will be writing to your blog host separately. The comment to which Mr. Davies takes exception, which was not written by a S&BCC blog contributor nor even a S&BCC member, has been removed. The article and the remaining comments can be seen here. If you want to know how bad you are, ask your computer. On arriving home from my weekend in England at the 4NCL I ran my games through the computer - and I do not much like what it has told me. ...well, I already knew I played so badly that I apologised to my opponent, the next morning, for having won the game. I knew that there was a dismal series of dismal errors, first by myself and then by my opponent, beginning roughly around my 20th and proceeding a little beyond his 30th (30...Nb2, for instance, wins very easily). There were more errors than I imagined, both within that passage of play, and without. : but that was, at least, in time trouble (fourteen minutes for my last fifteen moves, three for my last ten) and at least I knew already that I'd played quite badly at the time. But what happened after the time control, which came when the following position had been reached, is beyond all belief - and beyond all understanding. It wasn't just missed by both players with an hour on the clock: it was missed in the post-mortem afterwards. It was not, however, missed by the computer. Had my opponent seen it, it might have beaten all previous contenders for the most completely won position I had ever failed to win. Horton-Bonafont, 4NCL division 4, round ten, Guildford A&DC IV v AMCA Dragons, board two. 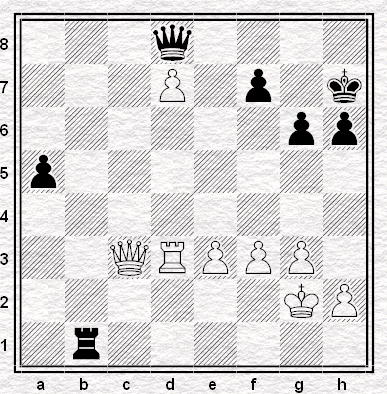 Position after Black's last move 40...Qe7xd8. Play now proceeded 41.Qc8 Rb2+ 42.Kf1 Qf6 43.f4 Qf5 44.Qd8=Q and the c8-queen now covers the squares f5 and h3 - which point, had it been grasped two moves earlier, would have led White to play 42.Kh3! rather than worry about 42...Qf6 or 42...Qg5. As it is, seeing White's 44th, Black resigned. But what did both players miss during this sequence? A smattering of sample posts: IM Andrew Martin's argument that games adjourned or adjudicated should not be submitted for grading; in the ECF Matters forum, the thread called ECF Matters; a humdinger of a dispute between Charles W. Wood and John Saunders that starts out of the blue here; and on the lighter side, When is it bad manners to play silly openings? But there's much more besides. The Index is here, where you'll also find a button to register yourself to post. The only downside I can think of is that there is no facility to post chess diagrams, and there is no play-through board available with which to post games, although one is promised for the future. 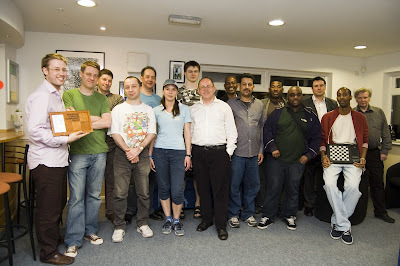 The Streatham and Brixton Chess Club Championship 2008 has reached its half-way point, and has already witnessed much excitement and several surprises. Top-seed Robin Haldane has dropped a whole-point having been mated improbably in the third round by Angus French, who along with Alexey Shumay leads the field with a perfect 3/3 - whilst the second-seed and present writer alone follows them on 2½/3. Only half a point behind a group of five players have 2/3 from the field of 20, all also chasing the first prize of a year’s free membership. 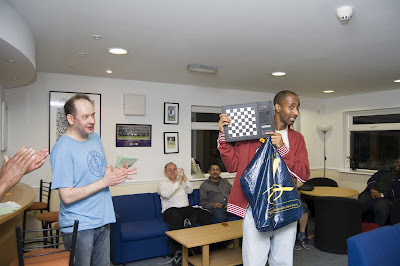 The same prize goes to the highest-finishing player from the second half of the draw, whilst a chess computer goes to the highest-finishing player from Streatham Chess Club, and there are other book prizes too. The final three rounds take place Tuesday 13th May from 7.30pm. Here's my drawn game from the second round against Barry Blackburn: an exciting battle where my opponent might have played on for a win at the end, had he not been so short of time, and another Interesting French Exchange. 17...Ne4! is particularly noteworthy decision, obtaining black the initiative for a pawn, as is the thumping 29...Rxg2+!, a move white had entirely missed. Finally, thanks go to Vad for the excellent photographs, which I recommend you click on in order to see full-size versions. Flash Club Championship update: Robin, last year's champion, and Tom, winner of the mid-season rapidplay, have both already dropped points. Only Angus and Alexey have made it to 3/3. Tom will bring you a full report on the first day's play - hopefully glossing over my rather woeful contribution to the entertainment - tomorrow. In the meantime, allow me to point you in the direction of Justin's post on Sunday - a fantastic problem by Reti. It's well worth a look if you haven't seen it yet. 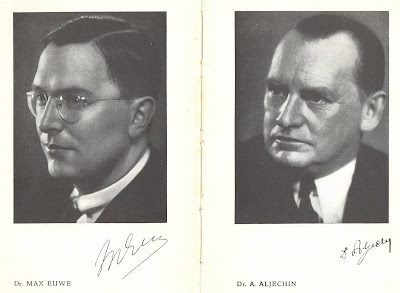 "In the restaurant he opined that Richard Reti had been an over-rated player, repeating Alekhine's despicable theories about the treacherous game in which both bishops are fianchettoed. I might have drawn his attention to his game against Filip but this didn't occur to me at the time. 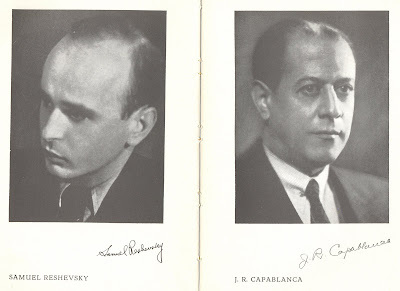 I restricted myself to observing that Reti had been a an endgame composer of genius, which he accepted." "He tells him that he is studying old opening manuals and then concludes: 'They don't waste time on the Catalan, Reti, King's Indian Reversed and other rotten openings.'" So, who is being described here? If you've been paying attention to your emails from Angus you'll know that the club championship starts tonight. 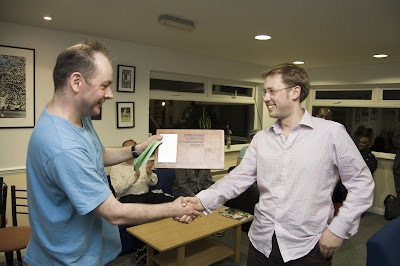 Aside from the sheer fun of it, prizes this year will include a chess computer and a host of books donated by Andy Thake. The tournament is open to club members - never to late to join us :-) - and won't cost you a bean. Turn up by 7:15pm if you wish to enter although Angus would prefer if you contacted him to let him know beforehand. So who are the favourites? 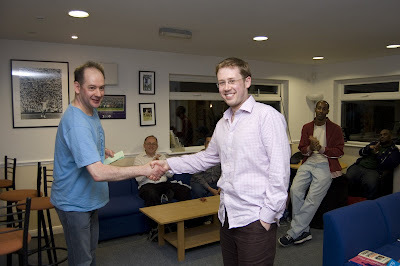 Robin is our reigning champion and Tom won the mid-season rapidplay back in January. Martin is always there or thereabouts and Angus consistently manages somehow to overcome the handicap of organising these events to put in a strong showing. I don't know if Adam and Carsten are returning this year, they lost out to Robin last time only after a play-off, but the tournament will be tougher if they do. Then of course there's the competition to remove the second free subscription from Chris' hands while the library players will be battling to be the one to perform way above expectations. I say 'one' but past experience suggests several of them will. (b) get the opportunity to test myself in battle against a certain fellow blog writer who shamefully bottled out of a couple of games with me in the Surrey Invidiual this year. However it turns out it will be fun. I hope to see you there. Newer members of the club won't recognise the name but old timers will recall Andy as a longstanding club regular who moved out to Singapore a few years back. 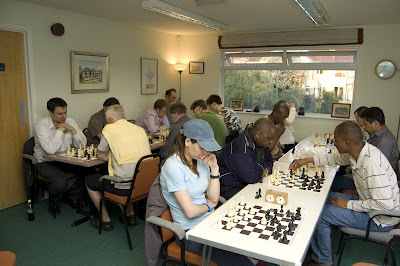 With no immediate plans to return to Blighty, Andy has generously agreed to donate his chess equipment to the club. We've decided to auction off Andy's books at a bargain price of £1 each with the money to go to club funds. The books will be available at the club over the next couple of Tuesday's. There are some real gems here - and several I'd buy myself if I didn't already have a copy. In addition to the sale, top 5 places at this year's club championship will win a book of their choice from the collection. Andy's chess computer - a Mephisto Nigel Short - will be given as a prize for the highest placed library player/non regular club member at the forthcoming club championship. Donated to the club for use in home matches. Sundry chess magazines to be given away free to anybody who wants them. Also free - a few tapes from Mike Basman's Audio Chess series. David Bronstein, El Maestro De La Improvisación, Chessy, 2007. Last Tuesday we posted a short article concerning the recent resignations at the ECF. It sparked off a fair few comments (24 and counting) and if you haven't seen it yet it's well worth having a look with direct or indirect contributions from three of the central players - Martin Regan, Claire Summerscale and particularly Peter Sowray who was kind enough to offer to respond to any points raised in the discussion. "... the Council meeting was poorly attended … I think I counted about 20." I don't see how any organisation of any kind can make decisions with these kind of numbers - and it was poorly attended? I dread to think how many people would have been in the room had they all turned up. No wonder things aren't moving forward. 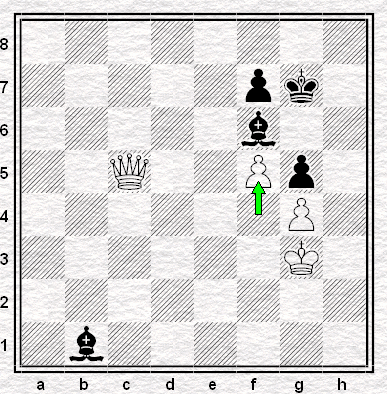 Matanovic v Sarapu, Sousse Interzonal 1967, round thirteen, position after 36...Rf8-h8. This is a very fine effort indeed: there are all sorts of ways to put the white queen en prise and more than one way to allow a mate in two. Yet Alexander Matanovic, playing the New Zealander Ortvin Sarapu, managed, despite time pressure, to find the absolute worst move on the board. 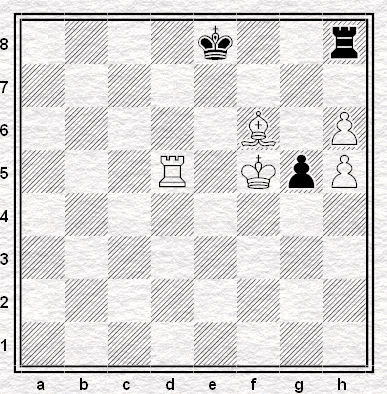 Readers are invited to find it themselves and to guess the move that followed. After that they can look at the game - and try and guess how Sarapu failed to win from there. I haven't the foggiest.